I'm kind of in recipe hell at the moment. Cookbooks here, veggie magazines there... loose recipe clippings everywhere! I dropped some cash at an office supply store yesterday for some binders, colorful dividing tabs, plastic sheet protectors, etc. in hopes of organizing my growing mound of recipes. I'm not sure why I keep clipping recipes... I'm fortunate enough to have a nice collection of vegetarian/vegan cookbooks... I really don't need to clip recipes. But I love food, and the draw of the challenge of trying a new recipe is too compelling sometimes... oh all right... ALL THE TIME! When I moved, I filled a "copy paper" box up with magazines, mostly foodie magazines... all because I hadn't had the chance to go through and clip recipes yet. It's a sickness I tell ya! Now that I'm moved and things are beginning to settle, I sat and tore out all the recipes I was interested in pursuing. I've put them all in a 3-inch wide three-ring binder. What I plan to do is, once I make a recipe and determine it's a keeper, I'll move that recipe to a "tried and true" recipe binder, which will be organized by subject. The T&T binder will be my "go-to" binder... recipes I know that my hubby and I both love and that I can make in a pinch. This recipe for babaganoush will be one of those recipes in the T&T binder. This was my first stab at making homemade babaganoush and it turned out delicious. Hubby thought so too. However, it doesn't look like it made the two cups stated in the recipe. Maybe my eggplants were not big enough. I did not weigh them before purchasing, I admit. I also need to research other ways of cooking eggplant... this was my first try at that too, and I felt like a failure. It seemed I scraped away too much good eggplant while trying to de-seed it. Preheat oven to 450 degree F. Pierce eggplants several times with a fork and roast in oven on a baking sheet, turning occasionally, for 50 to 60 minutes until the skins are blackened slightly and the eggplants are very soft. Cut ends off eggplants and peel skins. Cut open and remove long strands of seeds. Cut eggplant in large pieces and strain in sieve over a bowl for 10 minutes to drain excess water. 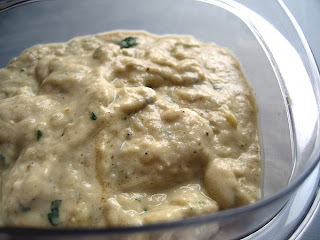 In a food processor or blender, blend together tahini, lemon juice, oil, parsley, garlic, cumin salt and pepper. Then add eggplant and pulse into a chunky puree. Serve in a wide bowl, drizzled with olive oil, along with warm pitas or veggies. I always wanted to try it! Will make it on next weekend! Thanks for great recipe!